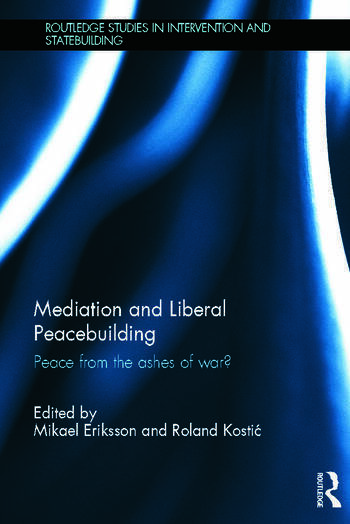 Mediation and Liberal Peacebuilding: Peace from the Ashes of War? This book offers a state-of-the-art examination of peacemaking, looking at its theoretical assumptions, empirical applications and its consequences. Despite the wealth of research on external interventions and practices of Western peacebuilding, many scholars tend to rely on findings in the so-called 'post-agreement' phase of interventions. As a result, most mainstream peacebuilding literature pays limited or no attention to the linkages that exist between mediation practices in the negotiation phase and processes in the post-peace agreement phase of intervention. By linking the motives and practices of interveners during negotiation and implementation phases into a more integrated theoretical framework, this book makes a unique contribution to the on-going debate on the so-called Western ‘liberal’ models of peacebuilding. Drawing upon in-depth case-studies from various different regions of the world including Bosnia-Herzegovina, Kosovo, Afghanistan, Sudan, Ivory Coast, Senegal and Sierra Leone, this innovative volume examines a variety of political motives behind third party interventions, thus challenging the very founding concept of mediation literature. This book will of much interest to students of peacebuilding, statebuilding, peacemaking, war and conflict studies, security studies and IR in general. Mikael Eriksson is a researcher at the Swedish Defence Research Institute, Stockholm. Roland Kostic is Assistant Professor at the Hugo Valentin Centre and Department of Peace and Conflict Research, Uppsala University, Sweden.